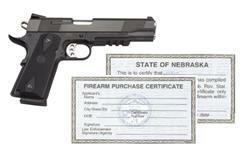 Nebraska residents who wish to purchase, lease or receive a firearm are required to obtain a firearm purchase certificate, according to Nebraska Statute 69-2403.The law applies to both retail and private party transactions, and it prohibits selling, leasing, renting or transferring a firearm to a person who does not possess a handgun certificate. Applicants may apply in person at the law enforcement agency that is in their jurisdiction. For example, residents of the City of Grand Island may apply at the Grand Island Police Department. Hall county residents who live outside Grand Island city limits may apply at the Hall county Sheriff’s Office. Applicants must currently be local residents. · Is under indictment or information (i.e. charges have been filed in court) for a crime punishable by imprisonment for a term exceeding 1 year.